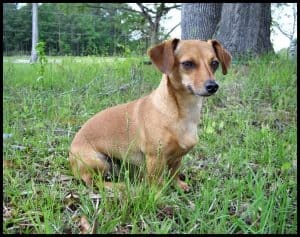 When looking for a cute crossbreed dog to have as a pet, the Chiweenie is among the ones at the top of the list. 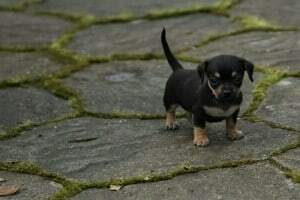 This crossbreed has the Dachshund and the Chihuahua as parent breeds. The body of this dog inherited the length of the Dachshund, while the legs inherited the shortness of the Chihuahuas. The overall size of the Chiweenie is influenced by the size of the Dachshund that was used in the breeding process, so a standard such dog would usually weigh not more than 11 kilos, while a mini would barely reach 5 kilos at most. The head of the Chiweenie can inherit either more from the Dachshund, with a snout a bit longer and thin, either from the Chihuahua and presenting itself in a domed manner. The ears can also vary in display, from floppy to pointy, depending on the dominant gene. Small legs and a tail medium in length complete the picture. The coat of a Chiweenie can come in almost any configuration, from shorter and thicker to longer and softer, also depending on what is passed through by the parents. The coat can bear a multitude of colors as well and also in combinations, but the most common ones are black, brown and tan. Most of the times, the Chiweenie is friendly and will get along well with people, especially with the ones with whom they have the chance to socialize more often. The intelligence and versatility of the puppies is sometimes mixed with some dose of stubbornness and this is overcome by combining the training process with positive reinforcements. The high levels of energy the Chiweenie has can be tempered by providing a lot of exercises on a daily basis, so that it also prevents boredom and mischief. This dog usually gets attached to one master, but they are always loyal companions. They best get along with older children who are able to interact with them in a gentler manner. The coat of a Chiweenie requires frequent brushing, especially if it’s a bit longer, in order to prevent tangles and mats. Bathing is only required once per month unless there are special situations, as there is a very slight odor on these dogs. Furthermore, they also need nail trimming and regular teeth brushing, as they are prone to gum and dental diseases. Chiweenies have a lower exposure to health problems, but two of the most important are the allergies they manifest to pollen and dust, which are indicated by watery eyes. These allergies have more chances of occurring if the dog lives mostly indoors and can be dealt with by the use of special air filters. There is a belief among some breeders that by mixing breeds the health level improves and the dogs are less susceptible to genetically transmitted diseases, but in reality it is a fact that any health condition both the Dachshund and the Chihuahua are prone to can be passed on to their puppies. Most common health problems a Dachshund is exposed to include hypothyroidism (a condition leading to problems with the weight, heart and skin), Inter-vertebral Degenerative Disc (a condition that manifests at the back and neck levels, generating pain, shivers, lethargy and can lead to a some degree of paralysis), Diabetes (an insulin production imbalance betrayed by excessive thirst, vision deterioration to loss, frequent need to urinate and a bad look of the coat) and seizures, which, same as with humans, are generated by abnormal activity of the brain and leading to lack or diminished awareness, uncontrollable muscular movements, urination, salivation and defecation). None of these are easy to deal with for both the dogs and their masters. On the Chihuahua side, the health issues include more often the dental problems (having small mouths and often crowded teeth, there is a higher risk for dental and gum diseases, while infection at the jaw bone level can lead to teeth loss), Luxating Patellas (also known as slipping kneecaps, which generate a fair level of pain and lameness; in some cases surgery is the only solution to provide something close to a normal life), Hydrocephalus (which is also known as water in the brain, leading to open fontanelle which is a bit different from the Chihuahua specific molera, seizures and some difficulty in walking) and hypoglycemia. The latter manifests through sudden drops in the sugar levels of the blood and usually leads to shocks. A general state of weakness, lack of orientation and coordination, shivers and even seizures are the signs for the existence of hypoglycemia. It is important to note that, simply because the parent breeds are prone to such health conditions, it doesn’t automatically mean that a Chiweenie will also suffer from them. But acknowledging them means a higher chance to prevent them or identify them at early stages, allowing proper care and treatment. The sooner a condition is discovered, the higher the chances of the dog’s body to react better to any treatment and successfully fight the diseases. The level of care a dog receives, from the quality of the diet, to the level of hygiene provided and veterinary monitoring are directly influencing the life expectancy of the dog. The life spans of both Chihuahua and Dachshund are rather long so, in turn, the Chiweenie can be expected to live no less than ten and no more than fifteen years. When talking about crossbreed dogs, it is important to remember that they are not too consistent in look like the purebreds are. Puppies from the same pair of parents can be very different from one another; they are actually unique, while the purebreds enjoy a much longer breeding process in time, which allowed them to gain trait consistency and to shape some standards in looks. However, there are some tips that can be given to breeders that wish to increase the level of consistency in look of the Chiweenie puppies. Firstly, it is important to focus on one or a set of characteristics that need to be in a certain way. 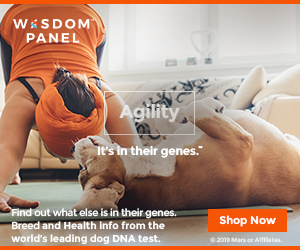 Only specimens having those specific traits should be selected for breeding and the process will spread across more generations so that the puppies will finally start to display those particular traits. Chiweenies are considered designer dogs so there’s no way they will be accepted in the records of purebreds in various canine organizations. There is also no established configuration for this dog to be considered a standard. Nevertheless, the IDCR (International Designer Canine Registry) did put down the Chiweenies in their records and according to it a dog is a Chiweenie if one parent is a Chihuahua and the other a Dachshund.